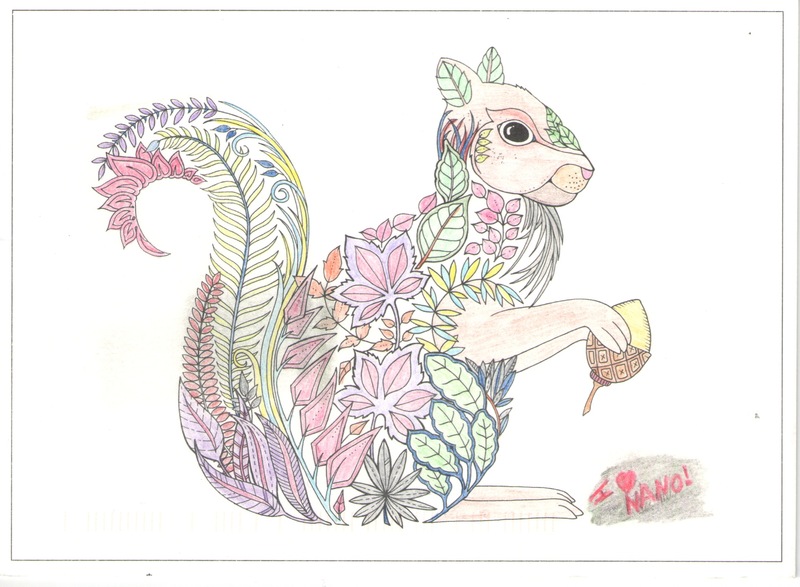 This postcard sent by a NaNoWriMo participant in South Carolina is from a postcard book version of The Enchanted Forest by Johanna Basford. I know because the local Staples was selling this postcard book and I remember flipping through it and seeing this exact card. I did not buy it, though. Basford was one of the first illustrators to hit it big in the coloring book industry. And once it took off, it seemed like everyone got into coloring for “therapy”. I am not into coloring. I tried, once or twice, but I did not feel noticeably relaxed after having done it. Listening to people randomly whack Tibetian singing bowls is more relaxing. Maybe it’s because I already do too many tasks during the day which I consider mindless and repetitive (like pipetting). I feel like it’s a fad. Oh, I’m sure there will still be people coloring in five years, but I think most people will have moved on to something else. As a teacher, I do use coloring in the classroom, though. For certain students, you need an activity that keeps them sitting with the class even though they have social anxieties. Plus, there’s no wrong answer when you’receive coloring.